Putting out food for our feathery friends is a great way to bring some life to the RainyDayGarden during the dead of Winter. This is especially important (to the birds) during really cold days or when there is a blanket of snow covering everything. On cold days, birds have to eat more to keep from freezing. 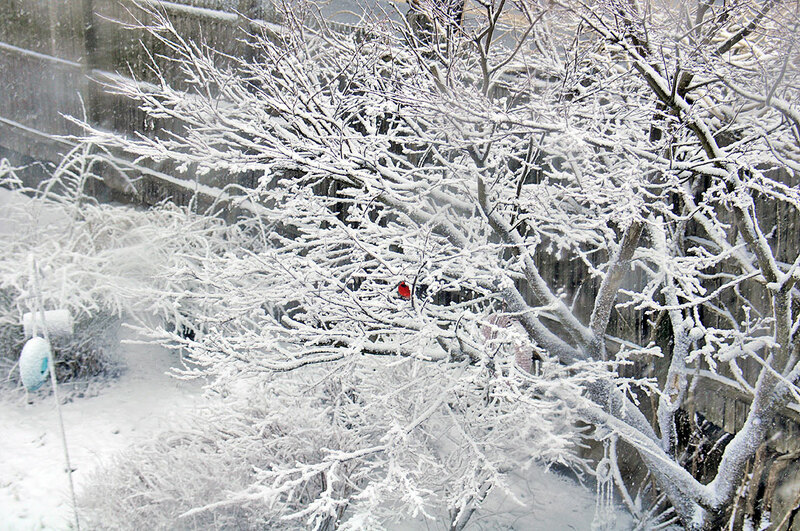 When it is snowing, what is available on the ground is not accessible to the birds. That is why our feeders are extra busy on snow days. We have been putting out black oil sunflower seeds, suet, and peanuts (with and without shells). The black oil sunflower seeds have a thinner shell and a higher oil content than other sunflower seeds, making them perfect for winter feeding. 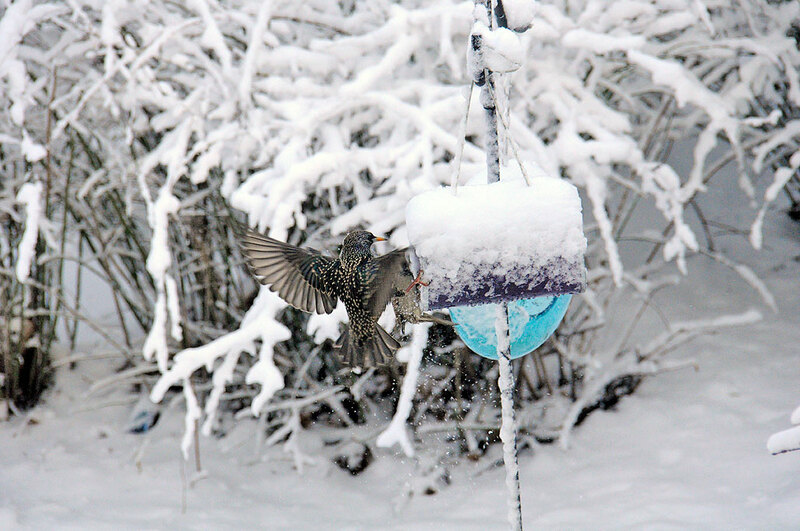 Suet and peanuts are super-high in calories, they don’t freeze, and are a welcome treat to all who visit our feeders. We have also been trying Cole’s wild bird feed this winter. Cole’s offers a wide variety of seed, suet and specialty products. Their products are all natural; their seed is top-of-the-crop pulls and have no fillers, preservatives, mineral oils, or pesticides. Judging by how quickly the feed vanishes from our feeders, we can conclude that the birds were pretty satisfied with the Cole offerings. It is also the only brand where they ate absolutely everything. 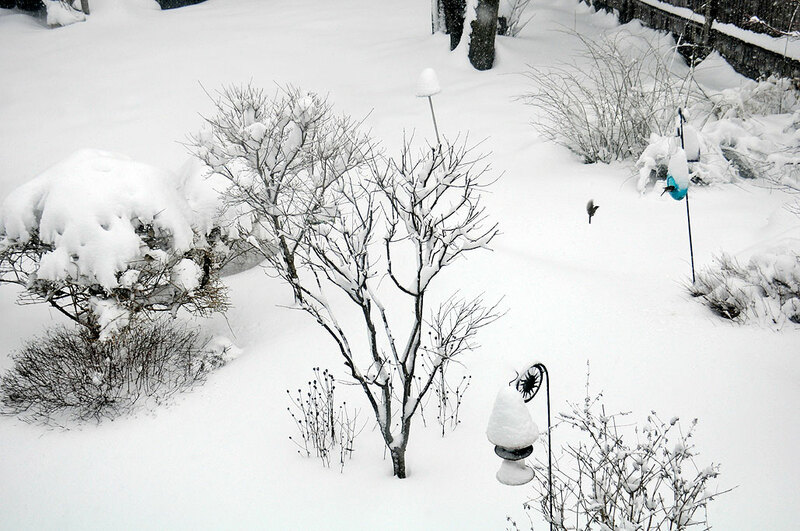 The interns started putting out bird seed several winters ago and noticed that the feeders often got doused in snow by the strom, completely covering the bird seeds. Of course, this problem was really an intern-al one, as they are disinclined to make the trek out to clean the snow off and re-make available the feed. However, they did note that both the Moon and Crackle feeders from Gardener’s Supply Company remained fully accessible, even during and after a heavy storm. No matter how heavy the snow is falling, somebody will be there looking for food. It is interesting to watch the behaviors of the sparrows as they work up their courage to venture out to the birdfeeder. First there will be a couple of fly-bys, with no landing for food. Eventually, the a “brave bird” will land on the rim, pick up a seed or a suet and dart back to the bush for cover. 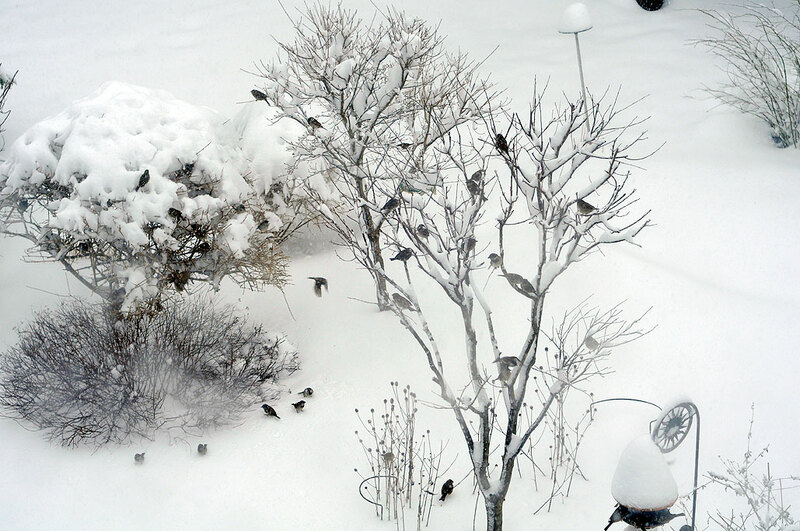 After a few more incident-free landings, the birds will relax and stay at the feeder longer. Once a few have successfully made the flights from the safety of the hiding place to the feeder, others will quickly follow. If there are no further signs of danger, then the feeding frenzy starts in earnest. A bird will feed for as long as it can stand its ground, which in most cases, is but a few seconds. While the Moon Feeder is “first come, first served,” the process is a bit less contentious at the purple Crackle Tube feeder. The grackles have a harder time at the tube, as they are a tad too large to fit inside. However, they are persistent and do often come away with a suet ball if they can hang on the edge and reach in. The sparrows have less of a problem as they have learned to go in one end and out the other (with a treat). It looks like a landing pattern at Logan. After two winters, these glass feeders (Moon, Crackle) from the Gardener’s Supply Company have proven themselves and we are happy that they are part of the RainyDayGarden. Both we and the birds are look forward to enjoying them for many more years. This winter is winding down. Hints of Spring are starting to show. We don’t expect to our freezing temperatures to hang around for more than a day or two at a time. We will continue to keep putting out feed until the end of Spring as the birds will be building nests and laying eggs. In the Winter, we have been feeding them high energy food like nuts and suet. What do we feed them in the Spring? We’ll have more to say about that come Spring.